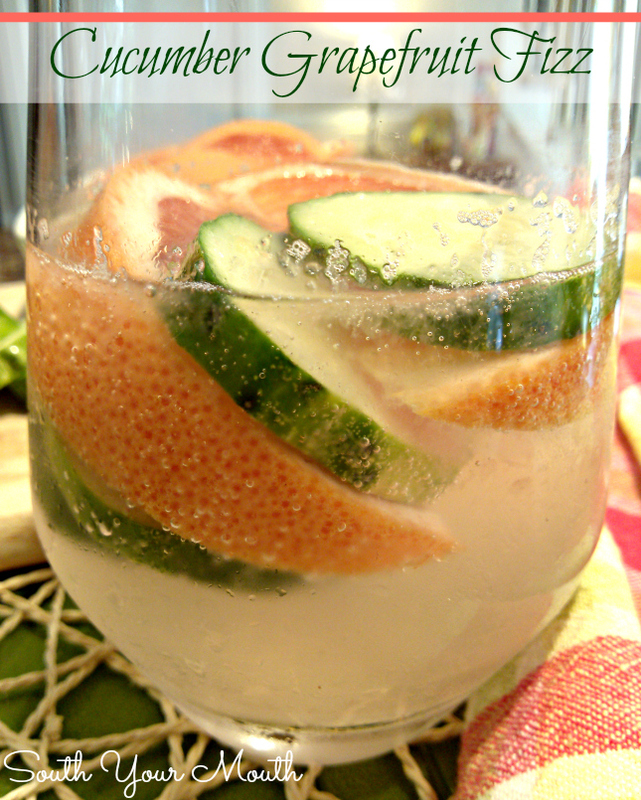 A sparkling cucumber and grapefruit cocktail recipe made with gin or vodka. I love cucumber water in the hot summertime. You know, where you just slice up a bunch of cucumbers and add them to a pitcher of water then keep it ice cold in the fridge? Man, there’s something about those cucumbers that just make you feel fresh and cool. I know it’s all in my head but I’ll take whatever relief I can get in this South Carolina heat. I also love grapefruit and gin. Like, I love it, love it. I first started drinking gin and tonic in my twenties when I didn't want to ingest eleventy million calories drinking beer when I’d go out and I really developed a taste for it. It always came with a wedge of lime but, for whatever reason, the lime just didn't jive with the flavors I liked from the gin so I started asking for lemon instead. And then one day, the bartender asked me if I’d ever had it with grapefruit. Holy WOW, Batman!! Grapefruit and gin go together like Bert and Ernie! So anyway, I kept seeing cocktails with cucumber and grapefruit on Pinterest and thought the combination sounded terrific so I decided to experiment a little. I first made this with tonic instead of the lemon lime soda and felt like it just needed a tad of sweetness in there so I switched it up and used lemon-lime soda. Bingo!! I've also made this with vodka and it’s delicious too. Use whichever appeals to you most. I likes my gin so that’s what I usually use. Combine grapefruit juice, gin or vodka, cucumber slices and grapefruit wedges in a tall glass and stir well. Fill glass with ice (most of mine melted before I could take this photo) and top with lemon-lime soda. Stir once more then serve. *If you take a liking to this or plan on serving guests, THE BEST way to make these is to combine your gin or vodka with several sliced cucumbers in a decanter and keep it in the fridge. The alcohol will really take on that cucumber taste and add a whole new level of flavor to your cocktail. Still add the fresh slices to your cocktail. Also, pickling or English cucumbers are WAY more flavorful than those big gunga waxy things they sell on the cheap. I've always been a Gin & Tonic girl too Mandy. Can't wait to try this!!! Thank you for your wonderful blog!